It may have been destroyed and rebuilt twice, but today marks the 40th anniversary of the 007 Stage at Pinewood Studios. The original 007 Stage was created to house Ken Adam's visionary set for the inside of Karl Stromberg's Liparus supertanker for The Spy Who Loved Me. The 007 Stage was officially opened on December 5th, 1976. British Prime Minister Sir Harold Wilson attended the opening of the 100m long stage. The grand soundstage was well-used by 007 filmmakers throughout the 1970s, but when a fire broke out before the production team was due to shoot the violent underground climax of A View To A Kill, a decision was made to rebuild rather than relocate. 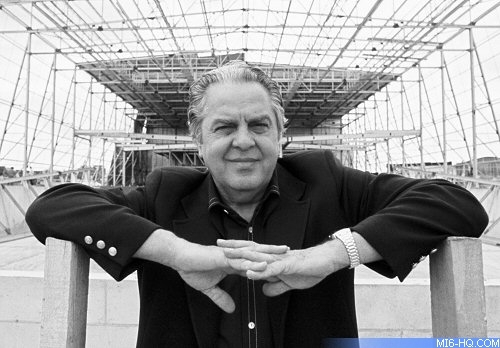 Between June '84 and January '85 Pinewood reconstructed the 007 Stage, renaming it officially in producer 'Cubby' Broccoli's honour: Albert R. Broccoli 007 Stage. After striking the sinking Venetian house sets, used for Casino Royale, a second fire broke out in July 2006. The production of Bond 21 was not compromised, but the extent of the fire meant that the stage would have to be demolished and reconstructed from the ground up. The new studio space was even larger than its predecessor, measuring 59,000 square feet, with an immense tank capable of holding 5.25 million litres. Pinewood completed the construction on the new soundstage in just six months. Click here for a history Pinewood Studios.